Disaster survivors can begin to address the financial issues that accompany disaster soon after securing safe shelter. Documentation is key to recovery. “You may think you will remember important conversations and details, but chances are you won’t be able to remember all of them” says Mary Peabody, a community development educator with University of Vermont Extension. 3:30 p.m.: Contacted Peoples Natural Gas Co. (phone number), requested gas shut off as soon as possible. Spoke with Tony Hernandez in Customer Service-Ext 3. They expect to complete work within 24-48 hours. Call back Customer Service to confirm before going into home. Billing authorized to stop on August 18. If you have homeowners or renter’s insurance you will need to provide proof of property ownership, estimated value and damage incurred. If you do not have insurance, you may be able to use the property loss as a deduction on your income taxes. When it is safe to enter the property, document proof of all property loss with photos and written details: manufacturer, model, serial number, age, value new, approximate current value and damage incurred. Remember to also document damage outside of the home. This may be the time to recruit family, friends and co-workers to assist you. Keep receipts and record all expenses related to recovery or rebuild efforts. They may be covered by insurance, assistance programs or be deductible on taxes. For examples, remember receipts for lodging, clean-up supplies, eyewear replacements, doctor bills related to disaster injury, and other related expenses. If you cannot stay in your home community, decide who will be your local communications contact. Peabody emphasizes that staying in communication and obtaining timely and accurate information about disaster recovery and assistance programs is another key to your financial recovery. Immediately after a disaster it is important to receive accurate community recovery information. 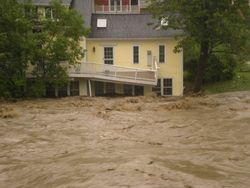 Attend or send a representative to all community meetings, often conducted by local officials or Vermont Emergency Management (http://vem.vermont.gov/programs/cert). Potential information shared at these meetings include: if cleanup supplies are available, programs available and disaster recovery updates. Information and rumor flows quickly in disaster situations and may be overwhelming. Do not hesitate to contact local officials to confirm any information that you are not clear about. This entry was posted on Tuesday, August 30th, 2011 at 12:29 pm and is filed under Crisis management, Disaster. You can follow any responses to this entry through the RSS 2.0 feed. You can leave a response, or trackback from your own site.